Time for a quick lesson with the English teacher! Several readers have asked me to explain how to use the verbs lie and lay--and no wonder, because this can get tricky. Here's the scoop. Obviously the word lie can mean "to tell an untruth." When this word is used, the conjugation is simple: present tense lie; past tense lied; past participle lied. No problems. More confusing is when the word lie means "to recline." That's what we'll tackle here. 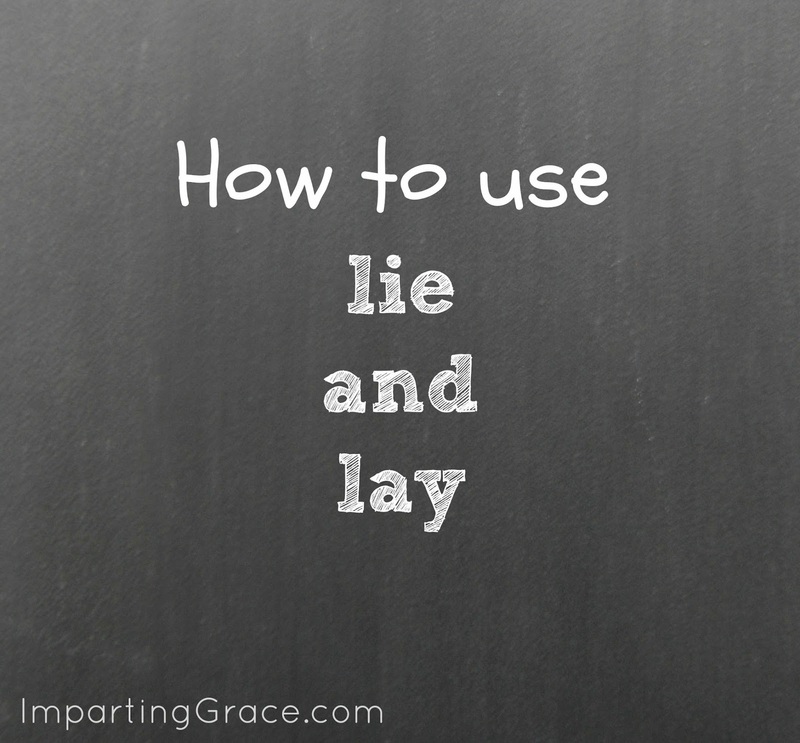 Here's a simple but important rule: to lie means "to recline"; to lay means "to put in place." In the present tense, the word lie never requires a direct object and the word lay always requires a direct object. I'm tired; I think I'll go lie down. Lay the book on the desk, please. Got it? In the present tense, lay requires a direct object. You have to lay something down. Remember those hippie phrases "Sock it to me" and "Lay it on me"? Well, they may have sounded stupid, but they were grammatically correct. 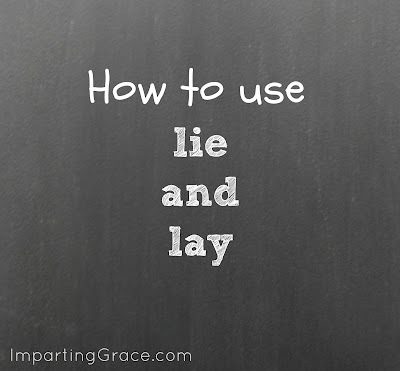 I think we get confused with lie and lay because there is some weird overlap in the conjugations of the two words. Obviously the present tense of lay is lay, but that word is also the past tense of lie. Eeek! The past tense of lay is laid. The word laid always requires a direct object. She laid the pile of clothes on the bed. Most people use laid as the past tense of lie, don't they? But the word they really need is lay. When was the last time you heard someone say, "If she had lain down when she first started feeling sick, she might not have been so ill"? It just doesn't happen very often. Most of us don't ever use the word "lain," even if it is correct. And you know what? It probably doesn't matter very much. I love to use words correctly, of course, but once again I come back to my philosophy that the purpose of language is communication--and our communication is probably not hampered too much by failing to use the correct past participle of the verb lie. So here's my advice: learn to use the present and past tenses correctly, and don't worry too much about the past participle unless you really have a strong desire to be precise or you're speaking or writing in a situation that demands perfect usage. __________ (lie/lay) down your burden. He was very sleepy, so he __________ (lay/laid) down and rested. She __________ (lay/laid) those things on the bed and left the room. If you filled in the blanks with 1. lie, 2. lay, 3. lay, and 4. laid, you're doing great! Now I think I'll go lie down for awhile. Ooh this was rather confusing at first but also made a lot of sense :) thanks for explaining it all Richella. Thank you for another wonderful lesson! Have a wonderful day! I always use this wrong. Or, I thought I did. :) Only half of the time I suppose! This makes my brain tired! Ha, I didn't get them all right, but most of the time, I think I do pretty good with my English & grammar. I know I make mistakes too though along the way. Thanks for stopping by to see the AL chair. Have a great weekend, Richella! Oh, and I LOVE your barstools you painted black. They look great! But thanks for another great lesson. I will definitely star this one, because I need the help! PS. I LOVE your new profile picture, but I keep forgetting to tell you!!! This is so useful -- I feel like I need to print it and hang it over my desk! Thanks! Hello sweet Richella! Oh how I'm missing the blogosphere these days. It's the season I'm in. Boo-hoo. I did, however, enjoy catching up on your posts. Have I told you how much I love English Teacher? I'm bookmarking lie / lay. I still have trouble with that one. And I cannot believe that we both posted about surprise nests this week! I found one too...on my front door. Love your post! 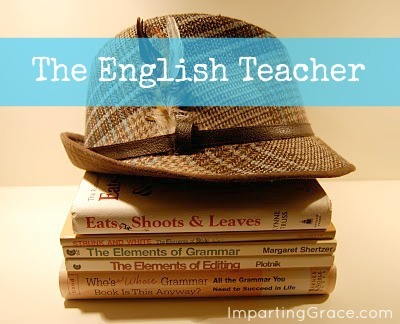 My father was an English teacher too. A grammar king! He past away last August......I miss him every day.....especially when someone is talking about the difference between lay and lie! Thanks for the memories!